The itinerary for this study day included a unique theatre, mediaeval castles and an introduction to the training of racehorses. On a blustery, sunny day 33 members headed for Richmond in the Yorkshire Dales and the Georgian Theatre Royal. 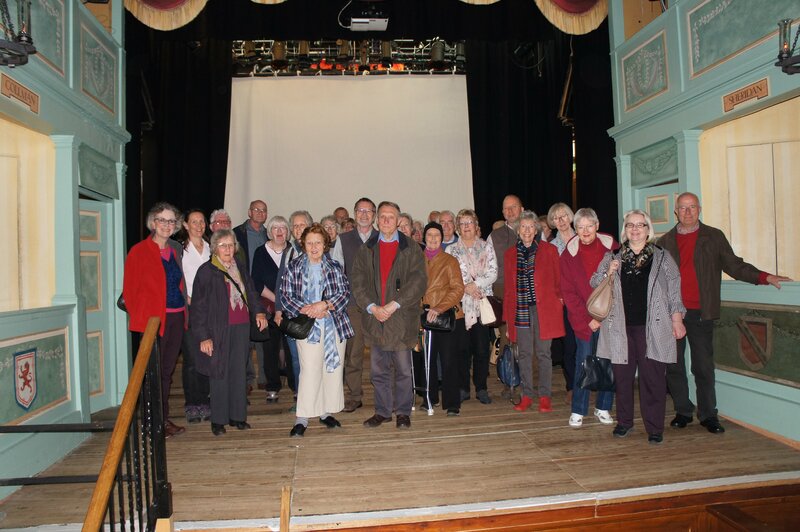 We were met by our excellent guide Gerry Broadbent, Chair of the Friends of the Theatre, who led us on an exploration of the Grade 1 listed theatre, built in 1788 for a travelling company run by 23-year-old actor Samuel Butler and Tryphosa Brickell. Due to their success they were given permission to create a theatre in the shell of an empty building. There has been much speculation about this vacant building, the latest theory being that it housed stables. Most of the money for the theatre was provided by Lord Zetland, with the Mayor of Richmond also contributing. The licence allowed performances for 60 days during September and October. Richmond was very busy at this time of year: the harvest was in; there were well-attended races at the local race course and lead mining was an important industry in Swaledale. The theatre was unused for the rest of the year. In the 1800s theatres began to fall out of favour nationally. Lead mining was declining locally, as was use of the racecourse. The theatre consequently suffered and closed in 1848. Fortunately for us, it was put to a variety of uses so escaping ‘improvements’ in Victorian times. It was rediscovered in the 1930/40s and reopened in 1963 as the oldest working theatre in Britain in its original form. Attached is a modern extension for a bar and other facilities; part of the original wall can be seen from the new building. 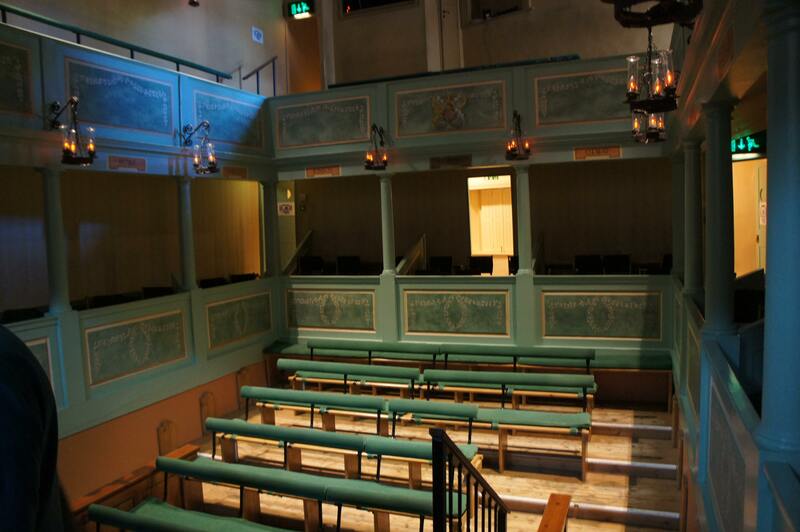 The theatres in York and Bristol are older but they have been adapted to give better views of the stage. The Georgian theatre still has a square auditorium so many seats have a restricted view. Other original features are the sunken pit, orchestra pit, trapdoors and much of the woodwork. The stage is still lit by tallow candles, treated to eliminate their smell. In the late 1700s the average weekly wage was 5 shillings. Butler’s actors were paid 15 shillings a week, and though he was a good employer this wage was insufficient for board and lodging. His travelling company toured the north of England and, while heavy items such as scenery were transported by cart, actors would walk between theatres. Edmund Kean, the actor famous in the early 19th century for his Shakespearean rôles, was with the company in his younger days. In the Georgian theatre actors lived in the two dressing rooms behind the stage which were without any facilities. Comfort was not a consideration for the audience either. Originally the auditorium could hold over 400 people who all sat on benches, which reached from wall to wall and were without backs or cushions. Now the capacity is half that. Boxes were only for the wealthy. They would send their servants to buy box seats where they would have to sit all day, reservation being unknown. During performances servants occupied the gallery above but were often kept busy providing their employers with food, drink, and other requirements. The sunken pit, very close to the stage, had the cheapest seats, for soldiers from Catterick garrison and other servants. The audience tended to be noisy and rowdy throwing food and shouting at the actors if they were displeased. The theatre has a small museum, which includes an old piece of scenery from the 1820s. It depicts a generalised woodland scene but is not original to the theatre. It has probably survived because it could be used in a variety of productions. The theatre is also licensed for weddings, held on the stage. A number of bridegrooms even opt to access the stage via an original trapdoor. 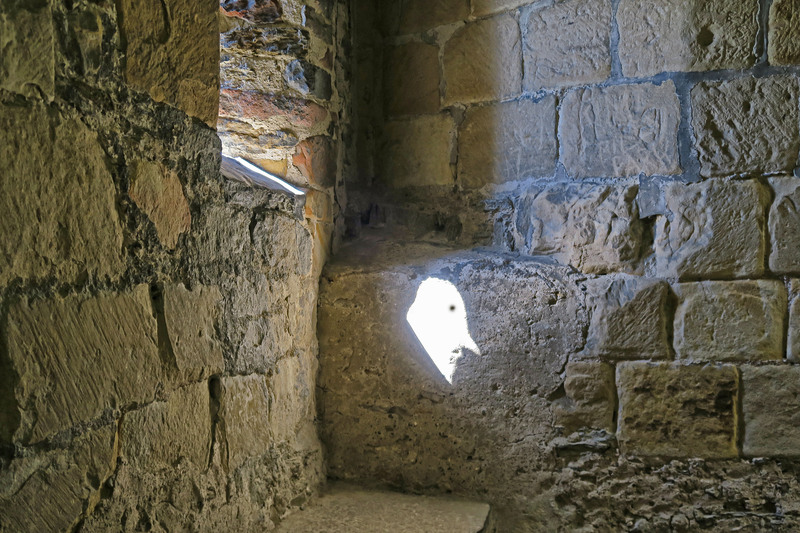 Richmond Castle is said to be the best-preserved example of an early Norman castle in England. Most of the walls of the triangular site date from the 11th century; those in the south are somewhat later and stand on top of a cliff along the River Swale. Members were free to explore the ruins, gardens or modern cell block where conscientious objectors, including the Richmond Sixteen, were imprisoned during World War I. They, and later prisoners, covered the walls with graffiti which are now being documented and conserved for future display. 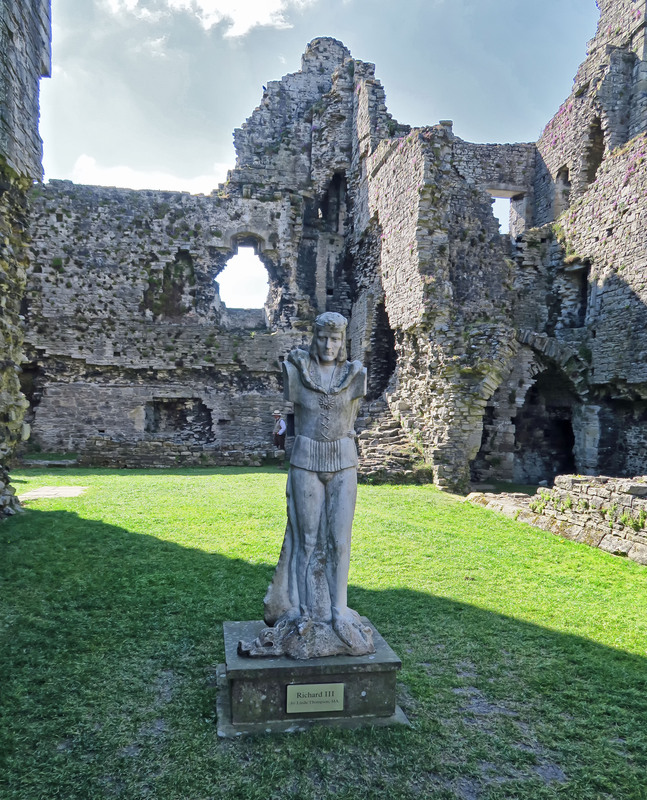 A scenic drive along Swaledale and across the River Ure brought us to Middleham Castle begun in the late 12th century. The site is compact with extensive ruins whose outer walls survive to a considerable height. There was much to investigate, the more intrepid members climbing the many steps to enjoy views of racehorses in an automatic walking exerciser, Wensleydale and the surrounding countryside. Middleham is the home of Mark Johnston Racing, motto “Always trying”. Mark, a veterinarian and the leading trainer of two-year-olds, runs three very well equipped yards with more than 200 horses and over 100 staff. He buys in yearlings every year for training. Neil, one of his two full-time vets, gave us a very informative and entertaining talk. A racehorse is equivalent to an elite human athlete and treated as such. Horses are housed in spacious loose boxes and fed three times a day with as much as they can eat of a branded special diet rich in fat and carbohydrate with vitamin and mineral supplements and guaranteed not to contain any banned substances. Haylage, low in water, is provided as roughage. It is a myth that old racehorses end up as dog food as they will have been treated with medication during their lives; this prohibits their use as animal food. However, they can make excellent riding horses because of the training they have received. Neil explained Mark’s training regime. Yearlings get six weeks daily walking and trotting exercise to condition them, ie getting the fat off and building up the cardiovascular system. They are then given 4-6 weeks cantering exercise when they become very close to race fit. Horses are compared against their peers in fake races in which their potential becomes clearer. The length of these races is stepped up to determine the optimum distance a horse can race at. The best are then entered for races as two-year-olds and tend to be sprinters. Some horses require a further year to develop fully and are usually the stayers. To ensure plenty of winners, horses are matched to races on ability and distance. Apparently a horse’s weight is an accurate predictor of race winning so horses are weighed twice weekly. Training and veterinary facilities are very modern. These include covered automatic walking exercisers and a swimming pool. Mark also has farmland with his own gallops. Some of the lads who join the stables are young, in their teens, and can live in houses owned by Mark. In addition, their clothing is provided, as are all meals. Hours are long, but hard work is rewarded, by gaining points, which can be exchanged for extra clothing and other items.